Le Grand Hall at the picturesque Allée Bleue Wine Estate in Franschhoek is both sophisticated and elegant. The modern, spacious events venue opens onto a courtyard, allowing for an easy indoor-outdoor flow that takes in rolling lawns and fragrant gardens – the prefect setting for a society wedding. 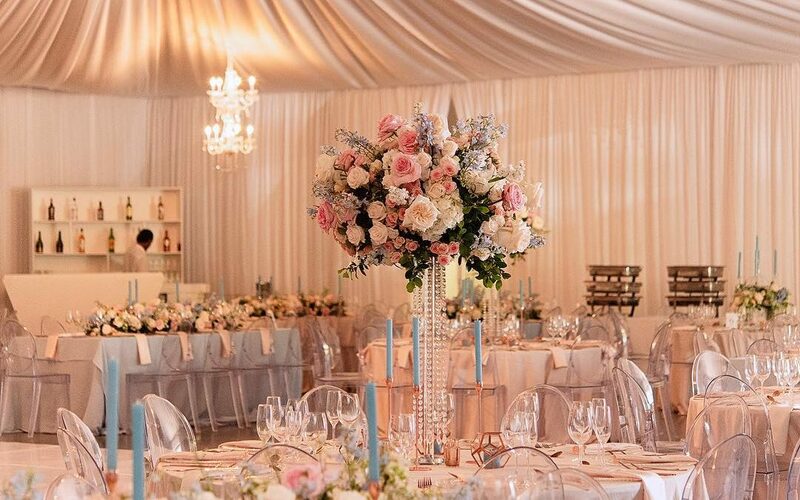 On behalf of wedding planners Pretty Different Events, The Events Draping Co. draping team was at Allée Bleue to fully drape the ceiling from the centre to the sides in classic white fabric, allowing for the chandeliers provided by Authentic Planning. The double volume walls were also draped in white, so that the venue was entirely transformed for the wedding! The challenging job was complemented by Mabel M Florals stunning flower arrangements.